1.-In buildings of this nature, its agenda and the relationships between the different activities it houses, are the building blocks that determine its definition. Beyond mere formal solution, this proposal is based on the review of the program (respecting the needs described) and the distribution of its activities, seeking more enriching relationships both inside the building and to its immediate surroundings. 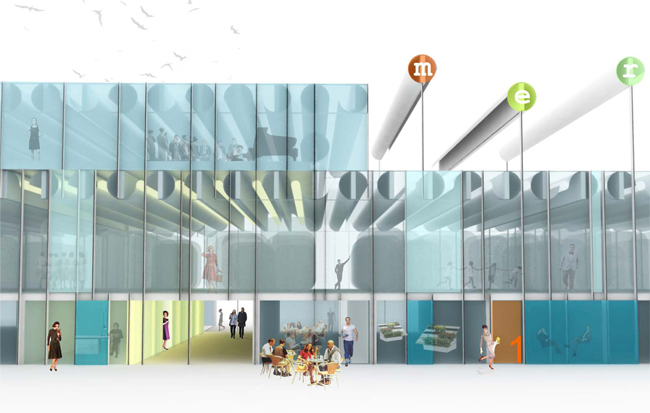 2.-This proposal revises the location within the building of some of its activities. It aims for raising marked the first level, using a comfortable main access ramp. 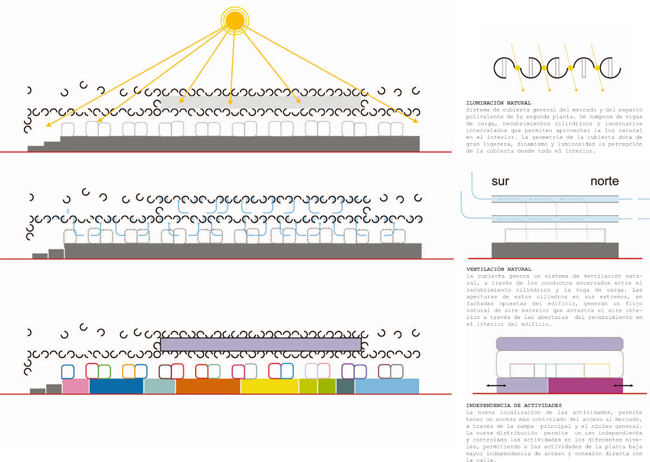 This decision allows for natural lighting in most market, through the skylights of the roof system. This new location allows greater control of market access, the ground floor being occupied by activities with independent access and control. System general market housing and multipurpose space on the second floor. It is composed of load beams, cylindrical coatings and interspersed skylights that allow use of natural light inside. The geometry of the roof gives lightness, dynamism and brightness perception of the cover from the entire interior. The cover generates a natural ventilation system through ducts enclosed between the cylindrical lining and the load beam. The openings of these cylinders at its ends, on opposite facades of the building, generates a natural flow of outside air that draws air inward through the openings in the coating on the inside of the building. The new location of activities, allows for a more controlled access to market access through the main ramp and the general core. 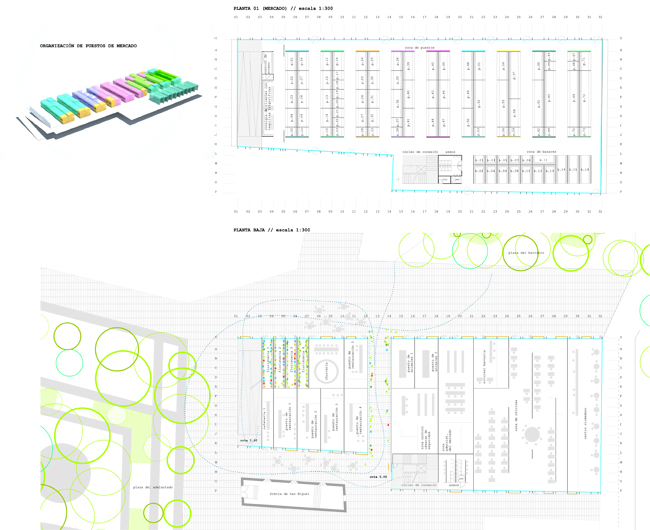 The new layout allows independent and controlled use of the activities at different levels, allowing the ground floor activities as independently access and direct connection to the street.